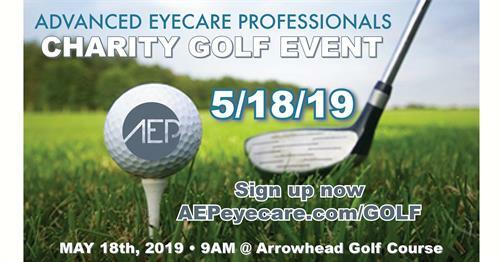 Advanced Eyecare Professionals (AEP) is hosting their 5th annual golf scramble fundraiser to support their annual Community Eyecare Week. This year's golf event will be on Saturday, May 18, 2019 at Arrowhead Golf Course in Lowell, Michigan. AEP’s doctors and staff will be donating their time and resources to help those in need. The charity golf scramble fundraiser and sponsorship proceeds go 100% toward Community Eye Care Week patients and those in need throughout the year. The charity golf fundraiser will feature multiple teams of four people playing 18 holes, fun golf contests with prizes, and a lunch.